I dunno if it’s cool to mention Richie Sambora or not (in fact I’m pretty sure it’s not, sorry Richie), but the dude sure did a lot for the visibility of Ovation double neck and triple neck guitars over the years. The CSE225-8TY isn’t an official Sambora model or anything like that, but it sure does remind me of being about 12 years old, watching Bon Jovi videos on late night TV. 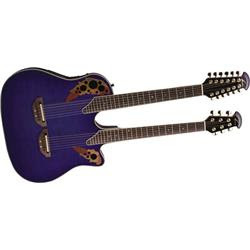 Jimmy Page also used double-neck Ovation models on the ‘Page & Plant – ‘Unledded’ project of the mid 90s.